Unclassifiable and Array QC failed samples are not shown in this plot. Boxes show the confidence interval for subgroup assignment generated by bootstrapping, and the individual data points represent the final probability associated with each subgroup call. MAC: Methylation Array Classifier will classify illumina 450k and EPIC medulloblastoma methylation array data in to one of four molecular subgroups: WNT, SHH, Group 3 and Group 4.
illumina 450k or EPIC data is normalised using the preprocessNoob function from minfi. The detection p-value for each probe on each array is obtained using minif, should any one array have more than 5% of its probes with a detection p -value, of grater than 0.05 these arrays are considered to have failed Array QC and will not be amenable to classification. The β-values of 10,000 probes used in our classifier are then extracted from normalised data for each sample. The 10,000 β-values for each sample are projected into the metagene space of our existing model, this is derived from the 450k data of our discovery cohort of 434 medulloblastoma samples. A multi-class optimised Support Vector Machine (SVM) validated and trained on 220 samples from our 450k medulloblastoma cohort is used to robustly assign subgroup to the projected test set produced in the previous step. The final probability assignment for a subgroup call is made by creating an SVM model with the whole (220 sample) 450k training set; these probabilities are given in the Classification Table in the initial tab. MAC: Methylation Array Classifier development was funded by a Cancer Research UK program grant. A compressed ZIP (.zip) file containing all illumina red and green channel .idat files as well as a sampleSheet.csv file is needed as input to use the classifier (see Input file fromat below for details). If you would like to test drive the classifier, or would like to see what an archive should contain a test zip file can be downloaded using the link in the grey box on the left. 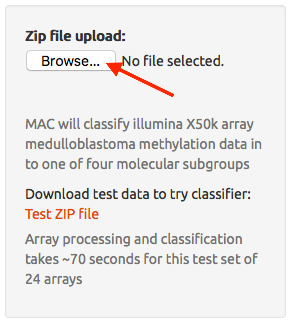 A ZIP file can then be uploaded by clicking on the 'Chose File' or 'Browse...' (browser dependent) button on the left, once uploaded the classification happens automatically. Each array on a illumina Infinium chip produces two corresponding files such as: 9403904132_R01C01_Grn.idat and 9403904132_R01C01_Red.idat; there will be a total of 12 (450k) or 8 (EPIC) these on each chip. The first part of the file name corresponds to the Sentrix barcode and the second to the location on the chip of the sample. All pairs of idats for each array need to be zipped up into a ZIP archive along with a CSV file SampleSheet.csv in order to be uploaded to the classifier. Following on from the header, each line corresponds to a sample on the chip(s) for the .idat files present, with the first column containing the sample name and columns six and seven corresponding to the Sentrix ID and row column position on the chip; these two strings must match up with the file naming convention mentioned above. 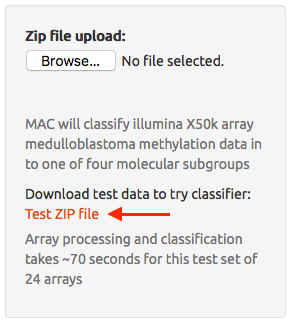 The SampleSheet.csv file must be included in the ZIP achive in order for MAC: Methylation Array Classifier to assocate each pair of idats with each sample, failure to do so will prevent the classifier working. Finally the last line in the sampleSheet.csv must be terminated with a carriage return. If you have any issues with using MAC: Methylation Array Classifier please contact Reza Rafiee. WARNING: MAC: Methylation Array Classifier is for research use only, and should only be used on samples with a confirmed histopathological diagnosis of medulloblastoma.